This weekend I’m hosting my fundraiser to get to America. Join me for The Boudoir Burlesque Show, a night of illusion and allure with burlesque and live music! I hope to see you there! Book your tickets here! 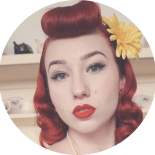 This entry was posted on March 26, 2019 by Miss Lady Lace in Burlesque, events, Pinup, YouTube and tagged 1940's, 1950's, blogger, glamour, miss lady lace, miss lady laces pinup blog, perth, perth pinup, perth pinup blog, perth pinup community, pin up, pinup, pinup blog, pinup blogger, pinup fashion, pinup girl, pinup life, pinup lifestyle, pinup perth, red lips, retro blog, retro girl, retro glamour, the perth pinup community, victory rolls, vintage, vintage blog, vintage blogger, vintage fashion, vintage girl, vintage glamour, vintage perth, vintage pinup blog. This glamour girl is in Hollywood! Day 97 of our 100 days of vintage. ✨ A bit behind posting, trying to catch up a little today before today’s adventures. Airport glamour. Day 96 of our 100 days of vintage.